JVA is pleased to announce the development of the third of several e-Live interpretive training courses offered by Professor John Veverka. We feel that any interpretive training experience should be taught by professional Certified Interpretive Trainers/Planners with college level degrees in heritage interpretation (ideally at the M.S. or Ph.D. levels) and/or with years of actual interpretive experience in the course topics being offered, to deliver college level interpretive training courses based on real world experience. This course is for any individual or organization involved in the planning, design and/or contracting for outdoor interpretive panels and wayside exhibits: landscape architects, park planners, interpretive planners, recreation specialists, interpretive specialists, environmental education specialists or others responsible for the planning, design and media development for interpretive panels. This course will be especially valuable for staff charge with contracting for interpretive panels who have no formal advanced training (university level courses) specifically in interpretive communications or interpretive media planning, design and evaluation. - Understand what makes an interpretive panel"interpretive". - Gain an understanding of interpretive panel planning elements and interpretive standards. 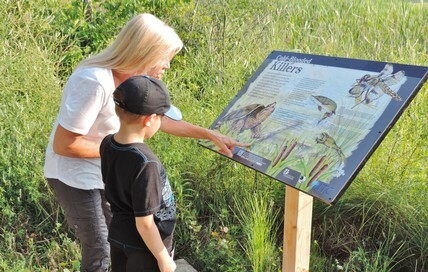 - Learn of design standards and new technology for outdoor interpretive panels. - Feel confident in planning and designing successful interpretive panel experiences. Develop an interpretive panel mock-up for a outdoor interpretive panel project you might be working on. (The course is set up for you to develop your panel plan and deign step-by-step, from each unit in the course. Final projects are flexible depending on your specific needs. Interpretive panel critiquing in Slovenia (National Parks). - When you've completed the Units you will be awarded a certificate of completion and 1.5 CEU (Continuing Education Unit) credits. The estimated completion time of the course is 15 hours - and you can work at your own pace. Unit One - Let's review what makes an interpretive panel "Interpretive". Unit Three - Interpretive Theme and Objectives for your panels. Unit Four - Understanding how your audience can relate to your panels. * A picture can be worth 1000 words (but the wrong 1000 words). Unit Five - Graphic selections (yours, theirs, or google)? Unit Six - Developing your draft layout - the wonders of WORD. - Sub headers and headline strategies. Unit Eight - Interpretive panel materials selection - what to make it out of? Unit Nine - Writing a "Request for Proposals" for interpretive panel design and fabrication. Who should I send my RFP too anyway? Unit 10 - Final project - your draft interpretive panel criquque. This Course is now ready to "go live" . You'll be able to register this course by sending an e-mail to John Veverka (he will send you the simple registration form), and then pay for the course via credit card or Pay Pal by clicking the "PAY NOW" button below. The cost for the 15 hours of training with live interaction with the instructor is $125.00 USD. If you're interested in this course and would like to enroll in it - send an e-mail to John at: jvainterp@aol.com. We will send you a course enrollment form. Then you can return to this web site page to pay for the course and get started. To pay for this course using paypal or your credit card - click the "buy now" button. If you are using paypal just delete "my" e-mail address and enter your paypay account details. Simple as that.